In a beautiful escape from the ‘loneliness’ of the pianist, the Derby Piano Quartet was founded in 2001 by Beate Toyka. 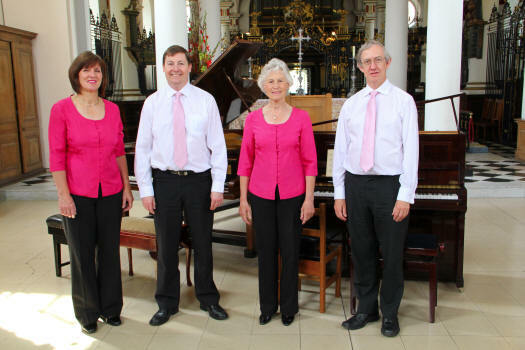 Four pianists - Gillian Bithel, Peter Gould, Richard Hodges and Beate - have met regularly and explored the strange and wonderful repertoire of music for 8 hands on 2 pianos. Nurturing the sense of fun in playing together they haven’t looked back and are now an established ensemble in Derbyshire and beyond. The Quartet play many pieces written especially for this combination of musicians but also include arrangements, some their own. They are constantly seeking out new and innovative additions to their repertoire. Their all-time most popular concert is entitled Piano Music from 1 to 8 hands and is precisely that. Gradually it builds up, from the hauntingly beautiful Scriabin Nocturne for the left hand alone to a vivacious medley of pieces from Gershwin’s ’Porgy and Bess’! At one stage the audience too gets involved and is asked to provide a 7th hand! The Derby Piano Quartet is one of the few ensembles worldwide that specialise in performing piano music for 8 hands in both original and arranged scores. Their aim is NOT to make piano music sound four times as loud, but four times more colourful and eccentric as would be possible with a mere two hands! A pleasant side product is the sociability of the music making, taking the pianist out of the lonely landscape of ‘The Music, The Ivories and Me’ and quite literally making piano playing an orchestral experience. Gillian Bithel was taught by her father from the tender age of 4 and throughout her childhood they played duets and two-piano music. She studied at the Royal Academy of Music in London. Her work has taken her all over the country, including many concerto performances and recitals. She now lives near Matlock in Derbyshire. One of Beate Toyka’s first musical memories is building a den under the piano while her father and big sister played the ‘Goldberg Variations’ in Max Rheinberger’s arrangement for 2 pianos! She studied at Cologne Conservatoire and the Royal Academy of Music with Hamish Milne. Besides working with the demands of the solo repertoire she has since tried to foster multi piano playing. She formed a similar group in Cambridge, and in Gaborone, Botswana…! Peter Gould had his first piano lessons in Portsmouth at the age or 6 with his father, who often played duets with him. He too went to the Royal Academy of Music, first as a pianist but soon changing to the organ as first study. He is now Master of the Music at Derby Cathedral, where he runs several successful choirs - for boys, girls and adults. He takes his choirs on international tours. He is also an examiner for the ABRSM. Richard Hodges also had his first piano lessons with his father at a very young age. One of his earliest musical memories is repeatedly listening to ‘Sparky’s Magic Piano’ on 78rpm records! He studied at the Royal College of Music in London, and, like Peter, quickly changed from piano to the organ. He has lectured in music at the University of Derby for the past 17 years, and is now Primary Subject Leader in ‘Performing Arts Technology’. ... The concert carried on furiously and the tempo and volume grew. The piece for six hands had been reached, when three pianists suddenly appeared from behind the piano dressed up as a strict teacher and two somewhat helpless pupils who, to judge by their clothing, had their piano lesson 200 years ago. An exceptionally funny scene, in which piano playing, mimic and gesticulation perfectly complemented each other and which received many cheers from the audience. Next up was a Turkish march, Beata Toyka therefore asked for a volunteer from the audience to accompany the piece on the triangle. And one boy actually did volunteer straight away and did his job brilliantly. Finally, not only did eight hands play Anitra’s Dance by Grieg on the two pianos, but in the encore the pianists presented one piece for eight hands on one piano. The public thanked them with much applause and Mr Abendroth, who is himself a music teacher at the Conservatoire in Osnabrück, was so impressed by the concert, that he spontaneously decided to let Ruller Haus keep the piano he had lent them." This highly unusual ensemble has delighted audiences in a variety of venues from cathedrals to piano shops since its founding in the year 2000. Based in Derbyshire the performers travel to different parts of the country. Programmes can vary in length and style and can include the popular “From 1 to 8 hands” selection which includes even pieces for three and five hands! Players introduce their pieces in an informal but informative style and can, on request, involve children through an accompanying quiz sheet. Venues with 2 Pianos are preferred but not essential. The ‘Quartet’ can travel with a second, high calibre, electric piano but depends, in that case, on a good quality grand piano in the venue. For bookings, please mail quartet@beates-music.co.uk. The complete standard piano repertoire!